Malcolm “Mal” West is a recently retired undercover police officer. His last assignment left him physically and mentally battered. Plagued with guilt at having betrayed the closest thing he had to a brother and at the same time proud to have been part of taking down one of the most powerful mafia families in the country, he’s decided to retreat to a quieter life. But moving next door to Pippa Smith was the start of anything but quiet. Pippa has been on the run from a cult leader, Isaac and his followers, known as The Family, for years. She’s learned the art of not getting close to anyone and staying not only under the radar but completely off the grid. Living just this side of a recluse, Mal’s arrival at the house next to hers is a new beginning for both of them in many ways. Mal’s retirement comes to a screeching halt when he is quickly recruited by Angus Force, a Homeland Defense Department Agent. The assignment: Infiltrate the cult that Pippa is hiding from and find out if she’s really on the run or secretly helping them pull off one of the biggest threats ever to homeland security. Both Mal and Pippa are learning to trust again in their own way. Pippa’s only experienced true friendship with Trixie, also a cult escapee, and for their own safety, their interactions are limited and infrequent. Mal’s natural inclination is to protect and joining a new team has reignited that passion, though arguably, it never truly died. The camaraderie that comes with being part of a unit, this one in particular, is serving to bring purpose to his life again. An undercover strategy that Mal shares is that it’s best to stay as close to the truth as possible so you seem sincere and you don’t have to worry about forgetting your “story.” It’s through his initiation into the cult that Mal’s backstory is shared—a clever way for the reader to find out more about him as Zanetti lays the foundation for these new characters. 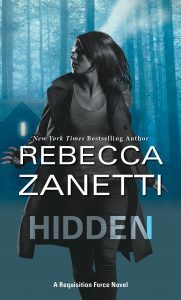 To her credit, Zanetti does a admirable job of balancing the set up of characters without sacrificing the storyline of the current book. There’s enough intrigue to keep you engaged throughout the narrative and at the same time Zanetti has teased you enough that you want to find out more about the other primary characters. It’s an exciting start to a new series. The characters are funny and you find yourself more and more curious about them. Mal is broken and conflicted but at his heart you know he’s a good person who’s driven to do the right thing. Pippa is not the strongest of heroines but she’s been in hiding for so long, it’s easy to understand her timidity in public and her fire when she and Mal are alone. I can’t wait for the next book in this new series to hit book stores. It’s clear the world that Zanetti has introduced and is building in will keep readers entertained for many novels to come. From the shoe eating, bourbon drinking dog, Roscoe, to the fashion challenged female ex-con hacker, Brigid—there’s no short of colorful from this crew.